15 December 2010, at 9:40a.m. US - Aviagen, Inc. has recently hosted Laurens Van Der Rijt of Lilydale, the recipient of the Canadian Broiler Hatching Egg Producers Association's (CBHEPA) Young Farmers Program, to the company's facilities in Alabama. Mr Van Der Rijt is a hatching egg producer from Bowden in Alberta, Canada. The visit to Aviagen was an opportunity for him to learn more about the US poultry industry and receive information about the latest management techniques and practices including information about Ross product performance, nutritional advice, veterinary issues, biosecurity objectives, production planning, and shipping/export processes. To get a first-hand look at best practices in poultry breeding and production, Aviagen representatives accompanied Mr Van Der Rijt on visits to a company hatchery, Egg Depot, pullet and breeder farms, and a commercial customer facility. Scott Gillingham, Regional Business Manager for Canada at Aviagen, said: "We congratulate Laurens on applying and being selected as the recipient of the CBHEPA Young Farmers Program for 2010. 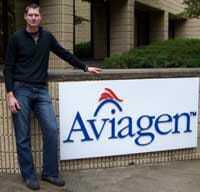 "Building strong customer relations and supporting our young farmers is a main focus for Aviagen. By sharing knowledge and ideas with our customers we help them grow their success with our products. We were very pleased to welcome Laurens to Aviagen." Through the Young Farmers Program, the CBHEPA provides financial assistance to one young producer looking to acquire or broaden his/her knowledge of the hatching egg industry in other countries. The applicant for this program should have less than 15 years experience in the hatching egg industry, or a young person who is working on the farm of a parent in the industry. The programme is designed around the young farmer's experience. Selected applicants are asked to prepare a short written submission outlining their working experience and the reasons they are seeking assistance from CBHEPA. Participants are also asked to share their knowledge and accomplishments of the program with CBHEPA members by preparing a written report and eventually presenting it to the CHEP Board of Directors.